Silverton was awesome. I never thought I would be able to do it, and I was "buggin out" all the way up until dropping into the first run. Then I was fine. If you don't know Silverton, it's not a resort. 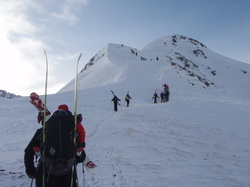 It is guided skiing, where the runs are accessed by a single lift, and the rest is hiking. And hike we did. I now know exactly how out of shape I am. I think I might have burned 8000 calories, no joke. There were seven of us total in the group, with one guide, and we got five really good runs in. I wont say that I was able to really look good while getting down the slopes, but I did get to break out the new skis, and they were as glorious as promised. There was no new snow, but our guide Dave knew where to find untracked terrain. Like I said, I didnt win any awards for lookin' good (except the skis...they looked good even though they weighed my pack down) but I got to do some serious turns and it felt as good as doing Tucks for the first time a few years ago. But I honestly thought I might perish at the end of the day. Im not the strongest hiker, and it was comical to see me sucking wind. The whole experience was awesome, and who can argue with getting picked up in an old UPS truck on the road after each run.